Oh yes another day in October another pumpkins… card… the digi is from Beyond the Fringe, i paper pieced (in PS elements) for the…. CAS-UAL Fridays… theme of In stitches, and Crafts4eternity – clean and simple. Entry filed under: beyond the fringe, CASual fridays, crafts4eternity. Love the stitching around your card. 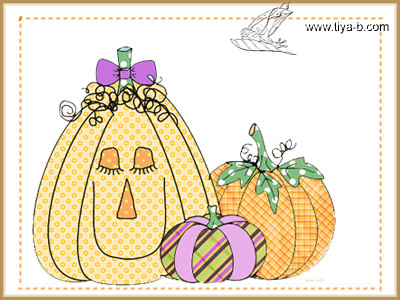 Those paper pieced pumpkins are adorable! Thanks for playing along with us at CAS-ual Fridays! Lovely card! Thanks so much for joining us at CAS-ual Fridays this week!